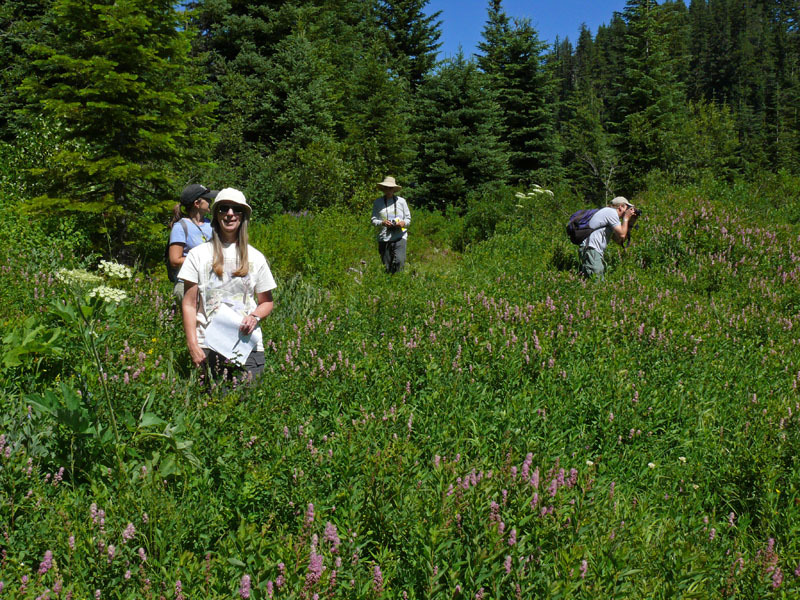 On Friday, August 3, Molly Juillerat and I took a group up to see some wetlands in the Middle Fork District of the Willamette National Forest where she works as a botanist. All together, including Anna and Sharon who also work for the district and who kindly drove us, we had 13 participants. There was quite a variety of folks. Along with the Forest Service, we had people from the Native Plant Society, North American Butterfly Association, and the Middle Fork Watershed Council. Since there are no trails at either site, and we were staying fairly close to the roads, people were mostly able to focus on their own interests, looking at plants, butterflies, dragonflies, and a handsome Cascades frog. 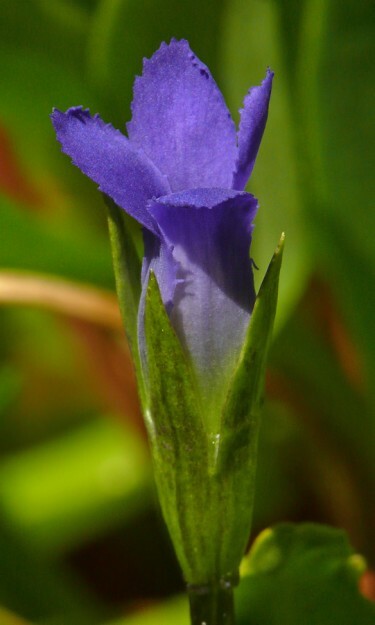 Despite their conspicuous color, one-flowered gentians are hard to spot. They are only a few inches high, and their flowers, like many other gentians, only open when it is sunny. We started the day at Warfield Bog. I was surprised that so many plants seemed not to have advanced very much since my scouting trip almost 2 weeks before (see Wetlands at Warfield Bog and Hemlock Butte). The most noticeable difference was that the Spiraea douglasii that is so prevalent there was now in bloom. This attractive shrub has many common names, including hardhack, steeplebush, rose spiraea, and the obvious Douglas’ spiraea. I was quite disappointed that the patch of one-flowered gentians (Gentianopsis simplex) that I had marked still weren’t in bloom, although one bud had at least developed some blue coloring. So I was very thankful when we discovered a large spread of at least 50 plants after we bushwhacked through the shrub thickets out to the edge of the bog. Several here were actually open, so many of us lined up to get our photos of this little jewel. There are only 4 sites in Lane County, and it is difficult to spot on a good day, so it is always a treat to find it in bloom. Asters had begun to bloom and we debated a bit on the species. Most of the other plants were finished. I was able to collect seeds of marsh marigolds (Caltha leptosepala) and mountain shooting stars (Dodecatheon jeffreyi). We also saw several patches of the rare swamp red currant (Ribes triste) both by the bog and on the other side of the road but could not find any fruit or sign that any had even flowered. The leaves of lesser pyrola (P. minor) are similar to those of bog pyrola (P. asarifolia), though smaller and duller. The best field mark for this species is the short, straight style, which barely reaches past the white petals. Bog pyrola has a long curved style. On our way back to the road, I led people to a patch of leathery grape fern (Sceptridium [Botrychium] multifidum) near the east end of the lake that I had come across on my previous trip. People always enjoy seeing these primitive plants. 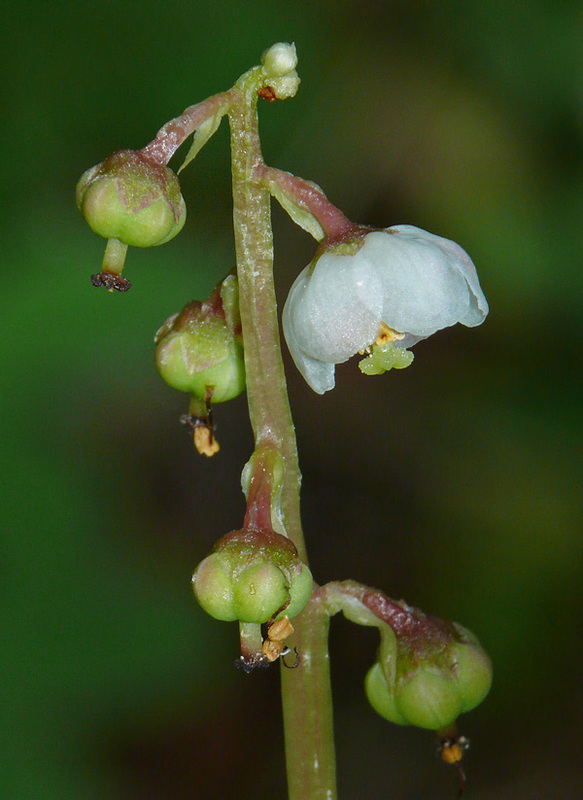 While searching for plants with fertile fronds, Gerry Carr noticed some blooming bog pyrola (Pyrola asarifolia). That was an addition to my list. Nancy Bray then noticed a smaller pyrola that had finished blooming. While it didn’t look like much, it was very exciting for me, as I recognized it as lesser pyrola (Pyrola minor), a far less common species and one which I’ve only seen in four places. 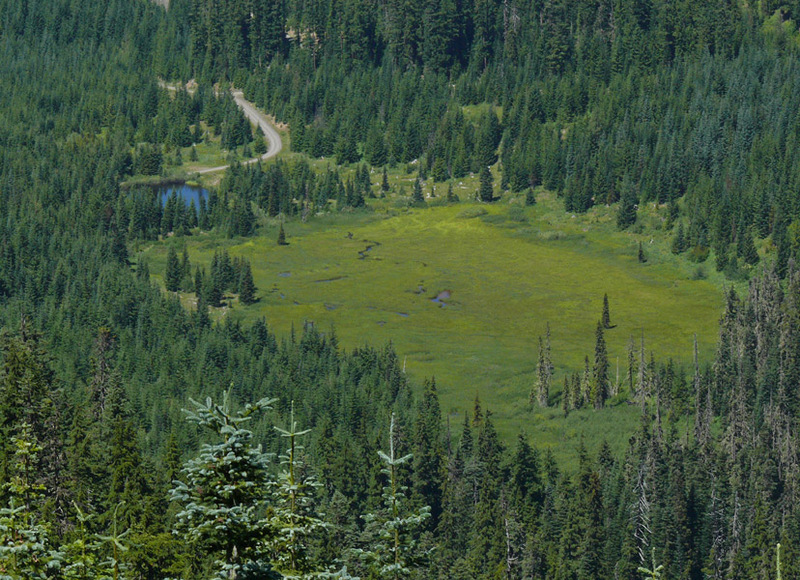 On my previous outing, to Hills Peak (see Hills Creek to Hills Peak), one of my goals was to relocate a population of this species. I’ve only once seen it in good bloom, at Park Creek, and have never been able to relocate that spot, so it is still a prize species for me. It was also on Gerry’s list of plants to find and photograph, so he was equally excited—although not so demonstrative as I—when Nancy’s sharp eyes found another plant with a single perfect flower. There were many clumps of leaves, but apparently only a small percentage produce flowers. That might be part of the reason this plant is so hard to find. Interestingly, the distribution of Pyrola minor is very similar to that of Gentianopsis simplex. 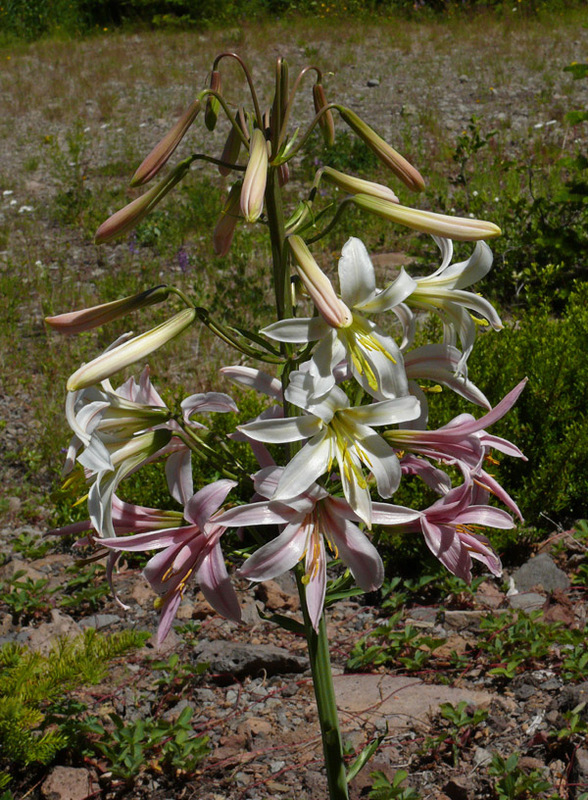 Both are found mainly along the Cascade crest and in a few places in the Wallowas and other eastern mountains. The Oregon Flora Project Atlas shows several Lane County collections by Orlin Ireland from the ’30s and ’40s of this plant but only one other relatively recent sighting in 1979. It would be interesting to try to relocate these old Pyrola minor locations. If only one could attach the scent to the image of this beautiful Cascade lily (Lilium washingtonianum)! We then took a short walk down to the end of the small road across from the lake. I couldn’t believe so many of the rock plants here were still blooming, including slender cryptantha (Cryptantha affinis), Oregon sunshine (Eriophyllum lanatum), and snapdragon skullcap (Scutellaria antirrhinoides). There was also quite a bit of blooming barestem buckwheat (Eriogonum nudum) that hadn’t been out a couple of weeks ago and the California harebell (Campanula prenanthoides) was coming into bloom. The highlight of this spot was a glorious specimen of Cascade lily (Lilium washingtonianum). There were 16 buds and about as many open flowers on this one inflorescence. The gorgeous scent was so powerful, you could smell it in the air from quite a ways. What a treat! There were also several more typical plants although the 10 flowers on one is still more than I usually see. After lunch by the lake, we headed to Hemlock Butte. Because we had a manageable number of participants, we were able to make several roadside stops along the way. 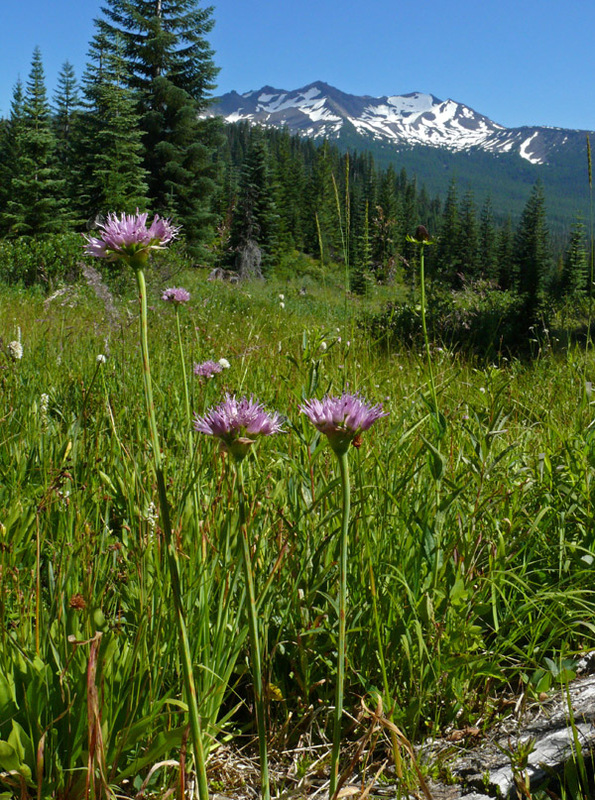 Up at the top of the ridge, by the intersection of the Wolf Mountain road, we saw a great display of colorful flowers, including Oregon sunshine, skyrocket (Ipomopsis aggregata), tongue-leaf luina (Rainiera stricta), and pink owl-clover (Orthocarpus imbricatus). There were also an abundance of delicious strawberries (Fragaria virginiana)—although not quite as many after we left! We also stopped at the seepy base of Wolf Prairie to see dozens of butterflies puddling along the road and the large population of bronzebells (Anticlea occidentalis), which were still in full bloom—a surprise to me. Unfortunately, the fact that flowering hadn’t moved very much in two weeks meant the Cascade grass-of-Parnassus (Parnassia cirrata) at our next stop were still in bud. From the road above, there is a great view of the small lake and Warfield Bog with its many pools of open water. It is also a terrific place to view the surrounding mountains, including Mount David Douglas, Verdun Rock, Fuji Mountain, the Three Sisters, Groundhog Mountain, and even Bohemia Mountain and Fairview Peak. Swamp onion (Allium validum) is unmistakable, looking nothing like our other onion species but sharing with them the strong onion odor. Diamond Peak is in the background. Finally we arrived at Hemlock Butte. Puzzling to me, things were quite different here than at my last trip—the kind of change you’d normally expect to see after two weeks. This area seemed to be on a different time table than Warfield Bog. The beargrass were completely finished, and there were only a handful of shooting stars (Dodecatheon jeffreyi) left in bloom. But the main plant we came to see, the rare swamp onion (Allium validum) was in full bloom. I had promised Gerry that we would see it, so I was relieved that I hadn’t miscalculated that. We wandered through the wetland, which was quite dry compared to my last trip, spotting the tiny yellow flowers of primrose monkeyflower (Mimulus primuloides) and fading sparse-flowered bog orchids (Platanthera sparsiflora) among the fresh white bog orchids (P. dilatata). I could not relocate the Gentianopsis simplex I’d seen in a lower section of the wetland, but, considering they were just starting at Warfield Bog, 400′ lower in elevation, I wasn’t expecting to. It was getting late, so we didn’t have time to explore the lower wetlands, but Molly indulged me by driving past there before turning around to head home. I could see a big pink swath of the swamp onions and a yellow one of the hairy arnica (Arnica mollis) that had started blooming on my previous trip. There’s never enough time to see everything, but I hope everyone who participated saw something that was special to them. A great report of a fabulous outing, he said, demonstratively!! !